The VMP-CE5CPYH is equipped with the Intel® Celeron® processor, giving you the performance you need for simple productivity and collaboration. You can create presentations, access cloud-based applications, collaborate with colleagues, and work on multiple documents at once—just like you’d expect. Or use it as media player. It features Intel® HD Graphics for stunning visuals. With a VGA output option there’s no need to buy a new display to support your Vision Media Player. Included Intel® WiDi lets you also connect wirelessly to WiDi-enabled displays or projectors. Use the VESA mount to fit the VMP to the rear of a desktop monitor, or mount it to the wall. And the Kensington lock security assures your VMP is protected from theft. Choose between Windows 10 or the Linux operating systems, or simply order it with none if you’d prefer to load your own image. Vision only use high quality components from premium brands such as Kingston and Micron. Choose from 2GB, 4GB, and 8GB. 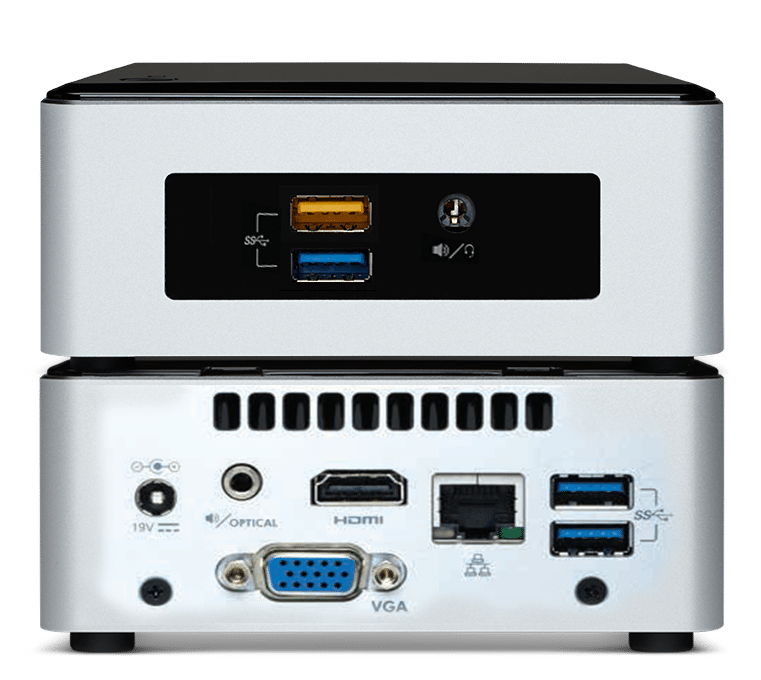 Vision Media Players use solid-state hard drives (SSD) for greater reliability and performance. Choose from 30GB up to 1TB. Or select a 2.5″ drive from 30Gb to 480GB. The pre-installed wifi and bluetooth adaptor is an Intel® Wireless-AC 3165 Dual band card which supports 802.11ac, speeds up to 867 Mbps, Dual Mode Bluetooth 4.0, and Intel’s Wireless Display.